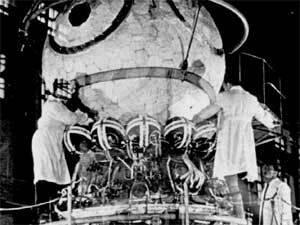 Assembly of the Russian Vostok mission spacecraft that would be manned by Yuri Gagarin. In 1961 Gagarian was the first man to orbit around the Earth. 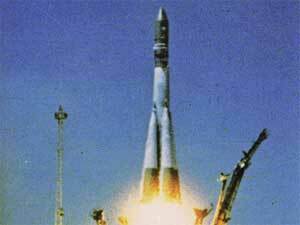 The launch of Vostok 1 at 9:07 A.M. (Moscow time) on the 12th of April, 1961 ushers in the era of manned space exploration. The cosmonaut Yuri Gagarin orbited the Earth once, spending 108 minutes in orbit before landing in the Saratov region of the Soviet Union twenty six kilometers south-west of Engels.